If you’re not familiar with it, Amazon Business makes it easy for business customers to find and buy from hundreds of thousands of sellers and helps sellers reach millions of registered business customers around the world. Similar to Amazon.com, buyers search for products from millions of available items. Once you find what you need, select your shipping option and check out. For businesses, personalization helps make the buying experience fast and efficient. From fast and relevant search results to customized messaging, buyers can find the items they need, and know upfront if they are approved for company purchase. Suppose you need to buy some office furniture for multiple offices. The first request is to find a tall table in order to display framed signage in your lobby, which isn’t one of your standard office furniture purchases. 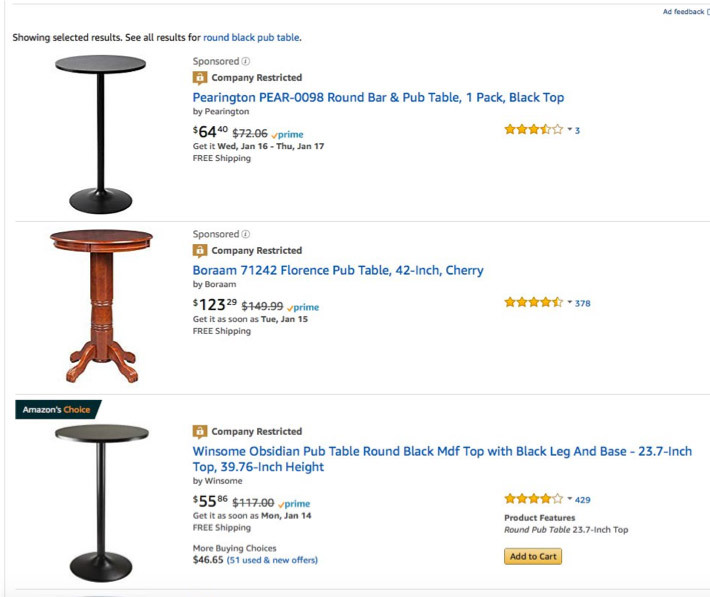 You know you need a tall, compact table, and you believe it’s called a “pub table.” Typing “round black pub table” in the Amazon Business search bar returns a list like the one below. 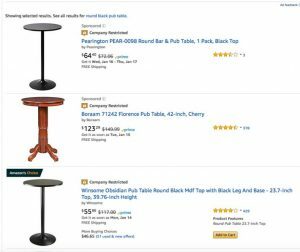 Notice that each table is marked “Company Restricted.” This is because your company’s account administrator created a policy to restrict purchasing non-standard furniture. Clicking on the item’s detail page will show a customized message on why the item is restricted. This is useful for the buyer to know they will need approval to purchase, and it could direct them to the appropriate team or person who can give approval or discuss the purchase in more detail. The next item that you need to purchase is an office desk. Searching for “office desk” returns a list of desks, and some are listed as “Company Preferred.” Items listed this way mean they have previously been approved for purchase. You can pre-approve specific items and restrict similar items in the same category, as seen below. Finally, you need to buy a desk for an office in a different location, say an office in a different state. When you log on to Amazon Business, your address is set to your default location. Since you want to ship to a different location, you can change the delivery address prior to searching for products through the location indicator in the top left of the screen. Doing this changes your search results because your company has different policies set for your other office. 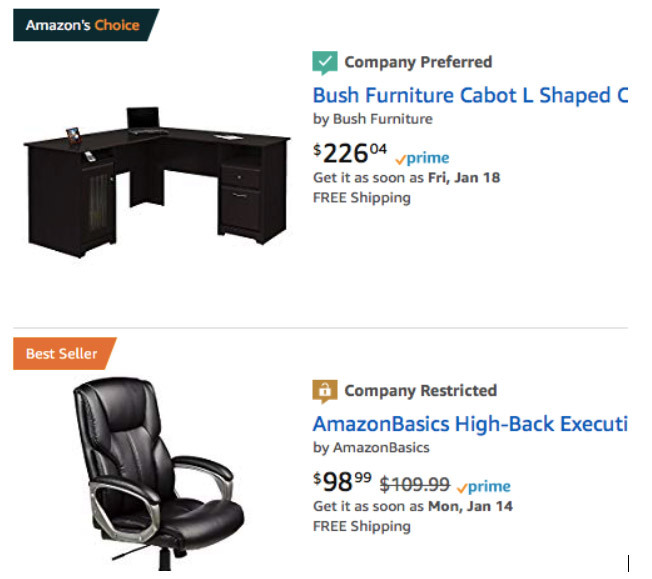 In our example, only one desk can be shipped to this other office, and clicking on the details for that desk displays a reminder that you recently purchased this same item. Your final cart contains two approved items and one restricted. When you check out, you’re reminded that one item is restricted but have the option to enter comments justifying why the purchase should be approved. This message is automatically sent to the approver, who will ultimately decide to proceed with the purchase or not. This walk-through shows how personalizing the buying experience within a business can lead to greater efficiency. By surfacing pre-approved items, you don’t need to spend time researching items or tracking down approvers. Also, because company-specific messaging is included, you can understand your company’s policy behind why an item is restricted. Finally, displaying your personal order history for an item can prevent unintended purchases, such as if you forgot that you ordered a month’s supply of paper the previous week. Overall, the personalized buying experience available on Amazon Business promotes quick and efficient purchasing, makes it easier to find the right products and helps to control rogue spending. In our next article, we’ll dive deeper into guiding enterprise users with procurement policies. You can learn more about guided buying with Amazon Business here. This post is sponsored by Amazon Business and is written by Doug Cerny, senior UX designer for Amazon Business, and Srikanth Avadhanam, head of Amazon Business Product Discovery (Search & Personalization) Experiences.